famous bluesmen as Peetie Wheatstraw and Tampa Red. Young Johnny danced and played tambourine with him, while their dog, Carburetor, strummed the guitar on cue. The Browns stayed in New Orleans and Natchez in between trips to towns in Arkansas, Louisiana, and Mississippi. In Natchez a Hollywood producer, impressed by their act, invited them to Virginia in 1940 to appear in the film "Virginia." The Browns and their dog were featured in the opening sequence. 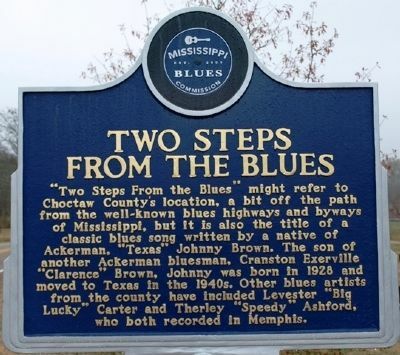 They returned to Natchez, and in 1950 Billboard magazine reported that Clarence Brown had recorded for a local company there, Sultan Records. He died in Ethel, Mississippi, a few years later. Location. 33° 18.607′ N, 89° 10.245′ W. Marker is in Ackerman, Mississippi, in Choctaw County. Marker is at the intersection of West Main Street and Commerce Street, on the left when traveling west on West Main Street. Touch for map. 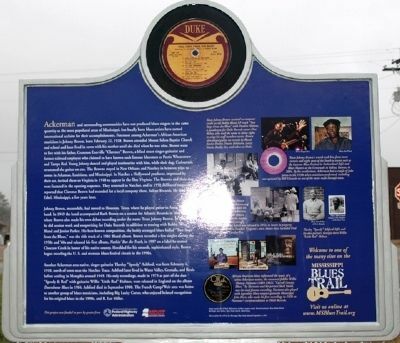 Marker is at or near this postal address: West Main Street, Ackerman MS 39735, United States of America. Touch for directions. Other nearby markers. At least 7 other markers are within 15 miles of this marker, measured as the crow flies. Ackerman (approx. 0.3 miles away); Coleman's Mill (approx. 3.4 miles away); The Great Eastern Hardwood Forest (approx. 8.9 miles away); Jeff Busby Park (approx. 8.9 miles away); The Old Natchez Trace (approx. 11.6 miles away); Hamill Spring (approx. 12.2 miles away); First Presbyterian Church (approx. 14.7 miles away). More. Search the internet for Two Steps From The Blues. Credits. This page was last revised on August 30, 2017. This page originally submitted on January 1, 2012, by Jeff Lovorn of Florence, Mississippi. This page has been viewed 529 times since then and 9 times this year. Photos: 1, 2. submitted on January 1, 2012, by Jeff Lovorn of Florence, Mississippi. • Craig Swain was the editor who published this page. Editor’s want-list for this marker. Wide shot of marker location. • Can you help?